Mum went and bought this years Aldi pies, so I figured I’d do a compare to last years. At a glance, the packaging is identical but there are some subtle differences I’ll let you work out for yourselves. The pies look the same. I’m pretty certain they are the same basic recipe too, so much of the 2016 review stands, however, not all of it. Below I’ve commentated on how full the pies are, well guess what…not now. The lovely boozy and fruity filling still tastes the same but there is a really quite large air gap now at the top of the pie. I wish I’d captured the pie weights last year, I’m certain they are under filling to keep the cost the same. So, on that basis, the filling rating is going down by two marks for this year but everything else stays the same. Well, the box is a bit boring really. It’s not at all Christmassy, which seems like a theme this year. Can’t somebody put something Christmassy together. Why does everyone feel the need to do this for their luxury pies? Anyway, it’s a boring black and red with gold trimmings. The only sign this is Christmas food is the bell at the top. I’m not impressed with the packaging design really, but I am happy to see a window. Window shouts confidence in the product and I know what I’m getting here. 4/10 – Harsh I know, but this does nothing for me at all. These are really nicely presented. The pretty pattern on top of the pie is really nice, everyone loves a snowflake right? Some uneven positioning on the top if I’m being picky. Solid and even bake all of the way around too. The base of the pastry looks quite thin, so it’s marginal for soggy bottoms here. These were nice and dry and crispy, but who knows what they’ll be like after they’ve sat a few weeks waiting to be eaten. Maybe just don’t let them sit, and tuck in. Nice to see a sprinkling of sugar too, but not crazy amounts, just right. 9/10 – Really pretty top, good amount of sugar coating, quality bake, nice colour. Really deep amount of filling here, smells very boozy too. Just look at that…impressive no? The filling looks a tiny bit liquified, maybe that’s the booze and that’s the soggy bottom risk, but has a good few chunks of fruit and bits in there. It’s a good amount overall and an example to others about what is a reasonable amount of filling on a pie this size. 8/10 – Yes, very good filling both in volume and appearance. This is the kicker then, this is where the real test is and is what counts to most people. I can’t help it, this is the best mince pie of the season so far. The pastry is sweet but not too sweet, crunchy but not dry, buttery but doesn’t coat your mouth. I mean, it’s great. The prettiness really helps it feel a bit special. The filling though, we have to talk about this filling. It’s outstanding. I could eat it right out of a jar and then probably get done for drink driving. I’m not saying it’s boozy, but a couple of hours after eating it I’ve got a hangover starting. The packaging notes that it is ‘cognac laced’. That’s like saying a road is tarmac laced. It’s basically a serious booze-fest. And it’s just lovely. It doesn’t overpower, but it’s there, ever present giving a warming finish to the whole thing. The rest of the filling is fruity and mince-like, but the blend with the cognac is outstanding. 19/20 – These are genuinely excellent tasting. I’ll be surprised to find a better mince pie this year. So, I’m genuinely surprised. I’m also not going to hear the last of this now, my Mum is not going to stop banging on about Aldi being the best. Bah. 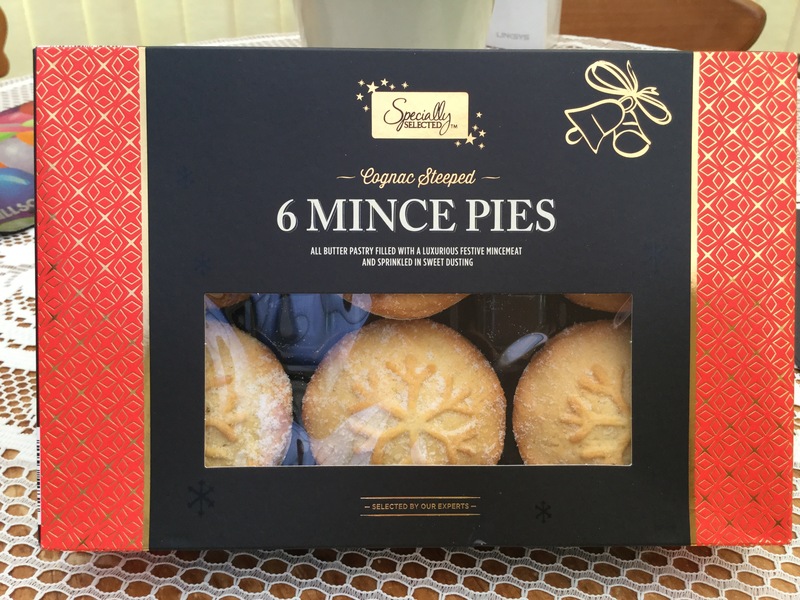 40/50 – Top of the leaderboard, very very good mince pie. Get particularly involved (and get a taxi afterwards). Previous Previous post: Elvis Lives!